Juan, A.; Guix, A.; Adelantado, F.; Fonseca, P.; Ruiz, R.
Juan, A. [et al.]. 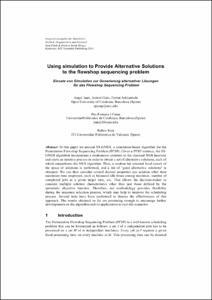 Using simulation to provide alternative solutions to the flowshop sequencing problem. A: ASIM Dedicated Conference on Simulation in Production and Logistics. "Integration aspects of simulation: equipment, organization and personnel: Karlsruhe, 7th and 8th October 2010". Karlsruhe Institute of Technology: 2010, p. 349-356.